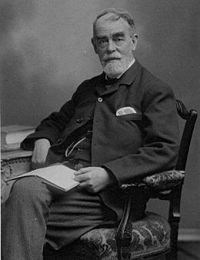 Samuel Butler (December 4, 1835 - June 18, 1902) was a British writer strongly influenced by his New Zealand experiences. He is best known for his utopian satire, Erewhon, and his posthumous novel, The Way of All Flesh, a semi-autobiographical novel which attacks Victorian era hypocrisy. Written between 1873 and 1884, it traces four generations of the Pontifex family. It represents the diminishing of religious outlooks from a Calvinistic approach, which is presented as harsh. Butler dared not publish it during his lifetime, but when it was published it was accepted as part of the general revulsion against Victorianism. 4.1.2 "The Book of Machines"
Butler was born in Langar Rectory, near Bingham, Nottinghamshire, England, into a long line of clerics. He was seemingly preordained to a career in church in pursuit of his father's wish and expectation. His father was the Rev. Thomas Butler, Rector of Langar; his mother's name was Fanny (née Worsley). He went to Shrewsbury School, where his grandfather, also called Samuel, former Bishop of Lichfield and Coventry, had been headmaster before retiring. He then went to his father's alma mater, St John's College, Cambridge, in 1854, taking a First in Classics in 1858. The graduate society of St. John's is named the Samuel Butler Room (SBR) in his honor. Following graduation from Cambridge, he lived in a low-income parish in London, during 1858 and 1859, as preparation for his ordination to the Anglican clergy; there he discovered that baptism made no apparent difference to the morals and behavior of his peers and began questioning his faith. This experience would later serve as inspiration for his work, The Fair Haven. Correspondence with his father about the issue failed to set his mind at peace, inciting instead his father's wrath. As a result, in September 1859, he emigrated to New Zealand, regarded as a British colony since a fairly legal Treaty of Waitangi between the British Crown and many New Zealand Maori chiefs in 1840, enabled the commercial exploitation of that country. Butler went there like many early British settlers of privileged origins, in order to put as much distance as possible between himself and his family. He wrote about his arrival and his life as a sheep farmer on Mesopotamia Station in A First Year in Canterbury Settlement (1863), and made a handsome profit when he sold his farm. But the chief achievement of his time in New Zealand was the drafts and source material for much of his masterpiece, Erewhon. He returned to England in 1864, settling in rooms in Clifford's Inn (near Fleet Street), where he lived for the rest of his life. In 1872, the utopian novel Erewhon appeared anonymously, causing some speculation as to the identity of the author. When Butler revealed himself as the author, Erewhon made Butler a well-known figure, more because of this speculation than for its literary merits, which are today undisputed. His father's death in 1886, resolved his financial problems for the last six years of his own life. He indulged himself, holidaying in Italy every summer and producing while he was there his works on the Italian landscape and art. His close interest in the art of the Sacri Monti is reflected in Alps and Sanctuaries of Piedmont and the Canton Ticino (1881) and Ex Voto (1888). He wrote a number of other books, including a not so successful sequel, Erewhon Revisited. His semi-autobiographical novel, The Way of All Flesh, did not appear in print until after his death, as he considered its tone of attack on Victorian hypocrisy too contentious. Erewhon revealed Butler's long interest in Darwin's theories of biological evolution, and in fact Darwin had, like him, visited New Zealand. In 1863, four years after Darwin published On the Origin of Species, Butler published a letter to the editor of a New Zealand newspaper captioned Darwin Among The Machines, in which Butler compared human evolution to machine evolution, and prophesied (half in jest) that machines would eventually replace humanity in the supremacy of the earth: "In the course of ages we shall find ourselves the inferior race." The letter raises many of the themes now being debated by proponents of the Technological Singularity, namely, that computers are evolving much faster than biological humans and that humanity is racing toward an unknowable future with explosive technological change. Butler also spent a great deal of time criticizing Darwin; his criticism was motivated partly because Butler (himself a man living in the shadow of a previous Samuel Butler) believed that Darwin had not sufficiently acknowledged his grandfather Erasmus Darwin's contribution to the origins of his theory. George Bernard Shaw (who also visited New Zealand) and E.M. Forster (who got only as far as India) were great admirers of the latter Samuel Butler, who brought a new tone into Victorian literature, and began the long tradition of New Zealand utopian literature that would culminate in the works of Jack Ross, Scott Hamilton, and William Direen. Butler developed a theory that the Odyssey came from the pen of a young Sicilian woman, and that the scenes of the poem reflected the coast of Sicily and its nearby islands. He described the evidence for this theory in his The Authoress of the Odyssey (1897), and in the introduction and footnotes to his prose translation of the Odyssey. Robert Graves elaborated on this hypothesis in his novel, Homer's Daughter. Butler also translated the Iliad. His other works include Shakespeare's Sonnets Reconsidered (1899), a theory that the Bard's sonnets, if rearranged, tell a story about a homosexual affair. In the 1920s Jonathan Cape published Butler's collected works in twenty volumes as The Shrewsbury Edition of the Works of Samuel Butler, but printed only 750 copies, making a complete set (if it can be found at all) unaffordable for the common reader. More easily available are the editions published by A.C. Fifield in 1908-1914 and the copies of his works at internet sites like Project Gutenberg. Erewhon and The Way of All Flesh remain in print as paperbacks. Erewhon, or Over the Range was a novel published anonymously in 1872. The title is also the name of a country, supposedly discovered by the protagonist. In the novel, it is not revealed in which part of the world Erewhon is, but it is clear that it is a fictional country. Butler meant the title to be read as the word Nowhere backwards, even though the letters "h" and "w" are transposed. It is likely that he did this to protect himself from accusations of being unpatriotic, although Erewhon is obviously a satire of Victorian society. The first few chapters of the novel, dealing with the discovery of Erewhon, are in fact based on Butler's own experiences in New Zealand where, as a young man, he worked as a sheep farmer for about four years (1860-1864) and explored parts of the interior of the South Island. (One of the country's largest sheep farms, located near where Butler lived, is named "Erewhon" in his honor. It is near Mesopotamia Station, another large sheep farm). The greater part of the book consists of a description of Erewhon. The nature of this nation is intended to be ambiguous. At first glance, Erewhon appears to be a utopia, yet it soon becomes clear that this is far from the case. Yet for all the failings of Erewhon, it is also clearly not a dystopia, an undesirable society such as that depicted by George Orwell's Nineteen Eighty-Four. As a satirical utopia, Erewhon has sometimes been compared to Gulliver's Travels (1726), a classic novel by Jonathan Swift; the image of utopia in this latter case also bears strong parallels with the self-view of the British Empire at the time. Erewhon satirizes various aspects of Victorian society, including criminal punishment, religion, and anthropocentrism. For example, according to Erewhonian law, offenders are treated as if they were ill while ill people are looked upon as criminals. Another feature of Erewhon is the absence of machines; this is due to the widely shared perception by the Erewhonians that they are potentially dangerous. This last aspect of Erewhon reveals the influence of Charles Darwin's evolution theory; Butler had read The Origin of Species soon after it was published in 1859. The three chapters of Erewhon that make up "The Book of the Machines" were developed from a number of articles that Butler had contributed to a local periodical while in New Zealand. Butler was the first to write about the possibility that machines develop consciousness. To him it was a joke, but today scientists and philosophers are seriously debating whether computers and robots could develop the same kind of intelligence (artificial intelligence, AI) and consciousness (artificial life) as human beings. It is also a popular theme in science fiction novels and movies; some raise the same question (Dune's Butlerian Jihad, for example), while others wonder what the relationship between human beings and machines with artificial intelligence would be and whether AI is desirable at all. Widely shared among the people of Erewhon is the belief that children choose to be born. Many other curious notions abound in Erewhon. In the chapter, "Musical Banks," Butler compares the practice of the cathedral to that of the old practice of coinage in an attack on the religious hypocrisy of his time. In his novel, the banks have their own currency, which is not honored by the other banks. In the old practice of coinage, during the age when the whole point of money was that it was made of precious metal, there was frequent trimming or shaving of coins once they were released to the public, even though people were expected to accept the diminished coins at their face value. These bits were sold under the counter to an assayer. There was also widespread counterfeiting. Banks of that era were few and quite magnificent, but they were circulating devalued goods that were not really as valuable as the original—an implicit critique of the Christianity of his age. It would not do for churches to be implicated in these activities. Thus, churches actually had money-changing tables at which each coin would be examined separately and a token of actual worth given to the layperson so that he or she could be seen by the other parishioners as putting money in the basket during that part of the service. These tokens had religious images upon them; this also prevented pilferage. The money-changing was not done at the same time as the service itself. (Some distinguished Protestant churches in the U.S. had this practice in the nineteenth century, besides the Church of England and the Presbyterian Church of Scotland). The practice goes back to the days of the Temple in Jerusalem, but then it was done for the different reason—so that money offered to the temple did not have the images of pagan gods on it. After its first release, this book sold far better than any of Butler's other works—perhaps because the British public assumed that the anonymous author was some better-known figure (the favorite being Lord Lytton, who had published The Coming Race two years prior). In 1901, Butler published a sequel, Erewhon Revisited, alongside a revised and expanded edition of Erewhon. Samuel's friend, Henry Festing Jones, wrote the authoritative biography: The two-volume Samuel Butler, Author of Erewhon (1835-1902): A Memoir (commonly known as Jones's Memoir), published in 1919, and now only available from antiquarian booksellers. Project Gutenberg hosts a shorter "Sketch" by Jones. More recently, Peter Raby has written a life: Samuel Butler: A Biography (Hogarth Press, 1991). The Way of All Flesh was published after Butler's death by his literary executor, R. Streatfeild, in 1903. This version, however, altered Butler's text in many ways and cut important material. The actual manuscript was edited by Daniel F. Howard as Ernest Pontifex, or The Way of All Flesh (Butler's original title) and published for the first time in 1965. It is currently in print again and, of course, should be the only version read. Butler's Erewhon influenced the genre of utopian/dystopian literature. The English satirist Aldous Huxley openly admitted the influence of Erewhon on his novel, Brave New World. ↑ Project Gutenberg, The Note-Books of Samuel Butler. Retrieved October 20, 2007. Jones, Henry Festing. Samuel Butler Author of Erewhon (1835-1902): A Memoir. Macmillan, 1919. History of "Samuel Butler (novelist)"
This page was last modified on 17 August 2015, at 22:30.